In the following video Akshat Sharma did a great job presenting their Journey to the web. NOTE: I will be going rather deep into this platform as I really like where they are going with this. I also see a few interesting use cases which I will touch on towards the end of this post. 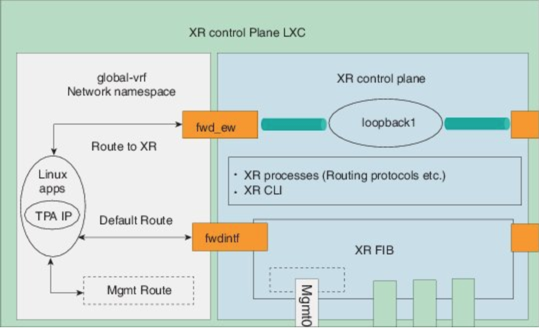 Cisco XR is based on the Wind River Linux OS which brings the capabilities to run applications (native or LXC/Docker), use configuration management tools (Ansible, Chef, Puppet, and etc. ), as well as use many Open Source tools. This platform also allows for monitoring and telemetry tooling to be used to handle operational aspects. Due to the push from the web guys (Google, Facebook, Microsoft, and etc.) they moved from QNX (32-bit) to 64-bit Linux in 2014. The ask was to include the ability to provide operational focused solutions to be available within the platform. Cisco XR is also multi-tenancy aware. Cisco XR natively runs two primary containers which are considered to be system containers. One being Cisco IOS XR (Control Plane) and the other being the Admin Plane. The OS itself runs as a HyperVisor (libvirtd), and the Docker daemon provides the container platform. There is also a third container space (Third Party) which allows customers to run their own containers in that space. This architecture builds along the lines of a container based modular system. You also have the ability to run native applications within the Control Plane. These applications resources are shared with internal IOS XR processes. The diagram below lays out the architecture behind native application hosting. Linux server - Used to develop applications, bring up Linux Containers (LXC), and prepare the container environment. Router - 64-Bit IOS XR used to host containers. 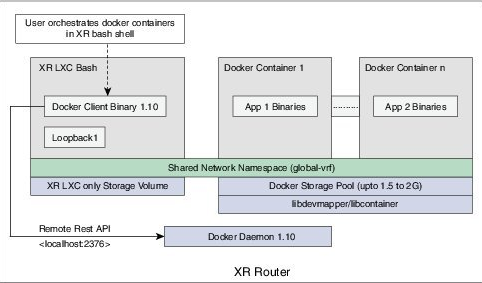 The diagram below lays out the architecture behind the Docker architecture on IOS XR. The cool thing (which I have not tested yet) is that you can also mock up scenarios using Vagrant and IOS XR. You can find more info on ios-xr/vagrant-xrdocs and xrdocs.github.io. They also have a few additional GitHub repos which can be found here. For a deeper dive into Application Hosting head over to Cisco’s Hosting Applications on IOS XR. IOS XR supports ZTP and iPXE which allows for automation and flexibility. In the following video Patrick Warichet explains the ZTP/iPXE support in IOS XR. IOS XR supports ZTP(Zero Touch Provisioning) which allows the box to be provisioned by user-defined scripts(bash/python) or a configuration file without any manual intervention. You can find more details on IOS XR’s ZTP functionality here. While participating in this session I found myself extremely interested in what the platform provides. Especially as I had honestly never seen it before. Understanding that I was not looking at this platform as purely a network device but rather a TOR based network device that could potentially be used for provisioning out racks of gear. Thinking of Webscale such as a massive container platform (completely automated). This device could be provisioned via ZTP/iPXE, then spin up containers to provide additional provisioning tools to further automate servers, switches, storage, and etc. I made a reference to an appliance in the session and what I meant by that is, using this device as my provisioning device for racks, datacenters, and etc. If I have this device provisioned via ZTP/iPXE and have the ability to run configuration management tools against it, I can then further use the same tooling to provision out my whole infrastructure by leveraging IOS XR as my provisioning appliance. I plan on digging into this platform more and hopefully get my hands on either the Vagrant environment or physical gear to further explore it’s possibilities. Being that it is Linux, I am sure that I can put this platform to good use!